Paul Davis On Crime: Is Cosa Nostra Now Selling Deadly Assault Weapons To Islamist Terrorist Groups? 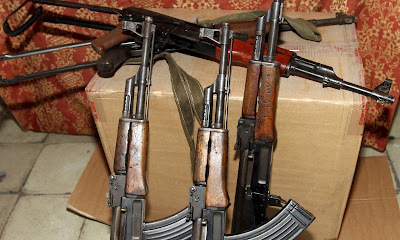 Is Cosa Nostra Now Selling Deadly Assault Weapons To Islamist Terrorist Groups? Mark Townsend at the British newspaper the Guardian offers a piece on the Sicilian Cosa Nostra selling weapons to Islamist terrorist groups. A huge gun-running operation masterminded by the Sicilian mafia is being investigated by senior police officers for potential links to “terrorist activity across Europe and beyond”. Anti-mafia prosecutors in Catania are investigating the possibility that Cosa Nostra is supplying assault weapons to organised crime syndicates from north Africa and firearms into the hands of extremists in western Europe. Decommissioned guns legally procured from the same Slovak dealer, Afg Security, which supplied the “mass casualty” weapons used by Islamists in the Charlie Hebdoand Paris attacks of January 2015, as well as the failed terrorist attack on a TGV in France last August, appear to have ended up in the hands of the mafia. Damn! I had no idea Cosa Nostra was still a viable entity. Thanks for the update.